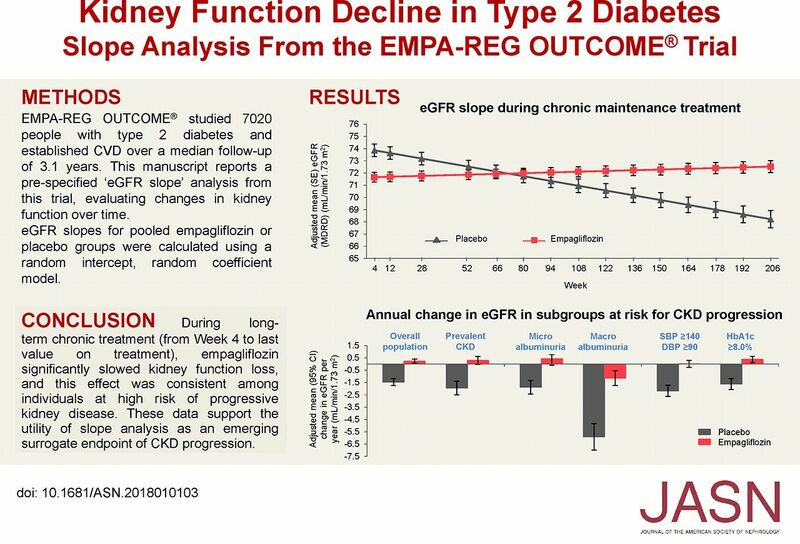 Background Empagliflozin slowed the progression of CKD in patients with type 2 diabetes and cardiovascular disease in the EMPA-REG OUTCOME Trial. In a prespecified statistical approach, we assessed treatment differences in kidney function by analyzing slopes of eGFR changes. Methods Participants (n=7020) were randomized (1:1:1) to empagliflozin 10 mg/d, empagliflozin 25 mg/d, or placebo added to standard of care. We calculated eGFR slopes using random-intercept/random-coefficient models for prespecified study periods: treatment initiation (baseline to week 4), chronic maintenance treatment (week 4 to last value on treatment), and post-treatment (last value on treatment to follow-up). Results Compared with placebo, empagliflozin was associated with uniform shifts in individual eGFR slopes across all periods. On treatment initiation, adjusted mean slope (eGFR change per week, ml/min per 1.73 m2) decreased with empagliflozin (−0.77; 95% confidence interval, −0.83 to −0.71; placebo: 0.01; 95% confidence interval, −0.08 to 0.10; P<0.001). However, annual mean slope (ml/min per 1.73 m2 per year) did not decline with empagliflozin during chronic treatment (empagliflozin: 0.23; 95% confidence interval, 0.05 to 0.40; placebo: −1.46; 95% confidence interval, −1.74 to −1.17; P<0.001). After drug cessation, the adjusted mean eGFR slope (ml/min per 1.73 m2 per week) increased and mean eGFR returned toward baseline level only in the empagliflozin group (0.56; 95% confidence interval, 0.49 to 0.62; placebo −0.02; 95% confidence interval, −0.12 to 0.08; P<0.001). Results were consistent across patient subgroups at higher CKD risk. Conclusions The hemodynamic effects of empagliflozin, associated with reduction in intraglomerular pressure, may contribute to long-term preservation of kidney function.